My sewing machine, Bernina 1630, has been in the shop since March 4, 2014 — six weeks and counting. It needs a part from the manufacturer, located in Switzerland. I just learned Bernina doesn’t ship parts as they are ordered. They pack a container, full of machines and parts, and when it is full, they ship to the U.S. on a ship. Once here, the machines and parts are offloaded and shipped to a distribution center in Chicago. There is no way to know if my part was placed in an empty container, waiting for it to be full, or if it was one of the lucky last passengers. 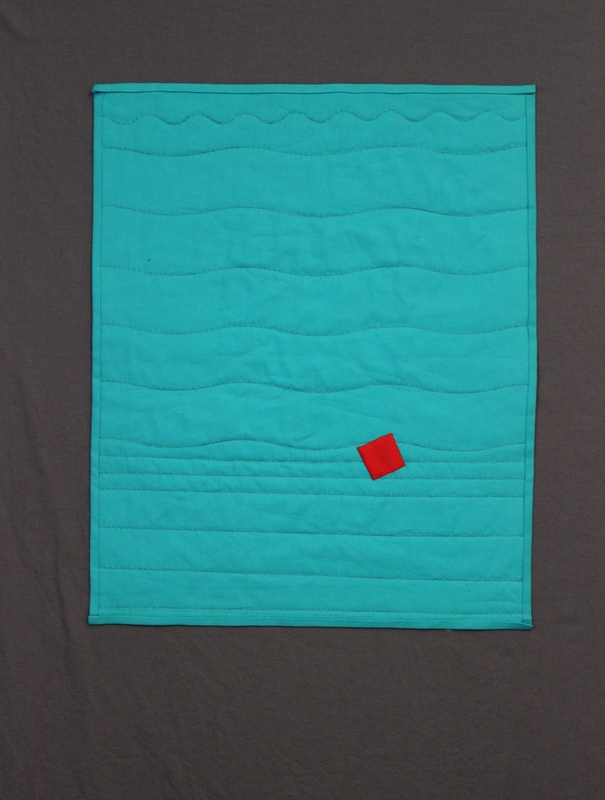 I hand appliqued the “Bernina part” and quilted “the water” by hand. I used the backing as the binding. I know you’re wondering — Switzerland doesn’t have a sea port. Right? I did some sightseeing on the country’s website: MySwitzerland.com. And it looks marvelous, but no port. Lots of water, though — “land of water” per the website. “Switzerland. Get Natural.” That’s the theme of the website. Tempting! I’ve been told I can’t fly to Switzerland and pick up the part. I just have to wait for my ship to come in.